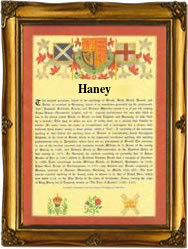 Recorded as Hain, Haine, Hayne, Heyne, diminutives Hainey, Haney, patronymics Hains, Haynes, Heynes and others, this is an English surname. It has several possible origins. Firstly, it may be locational from any of the places named from the pre 7th century word "heghen", meaning a farm or enclosure. Secondly it could derive from the English personal name Hain or Heyne, meaning hawthorn, or from the Old Norse Hagni, which also means hawthorn. Finally, the name may have originated as a German (Anglo-Saxon) topographical name for someone who lived by a patch of enclosed pastureland, from "hagen", meaning hedge. The surname first appears in the original form in the famous Domesday Book of England, whilst other early examples include: Peter Hain of Dorset in the year 1200; Adfridus Hane of Staffordshire, in 1209; William le Heyne also of Staffordshire, in 1327; Alice Heynes of Somerset, in 1327; and Margery Haynes of Essex, in 1352. John Hayney was one of the convicted Monmouth rebels who were transported to the Barbadoes, from Dorchester Jail, in 1685. The first recorded spelling of the family name is shown to be that of Ulricus Hagana, which was dated 1086, in the Domesday Book of Suffolk. This was during the reign of King William 1st of England and known as "The Conqueror", 1066 - 1087. Surnames became necessary when governments introduced personal taxation. In England this was sometimes known as Poll Tax. Throughout the centuries, surnames in every country have continued to "develop" often leading to astonishing variants of the original spelling.